Alternate Names: "Puzzle de Harvest Moon", "Puzzle Of Harvest Moon", "Harvest Moon Puzzle", "Puzzle du Harvest Moon"
Puzzle de Harvest Moon is a fast-paced, highly addictive puzzle game where you grow and harvest crops. Call in dogs to guard your crops, chickens to eat your opponent's seeds or horses to take over plots! Complete against your favorite Harvest Moon characters as you test your farming know-how! Four challenging modes of play! 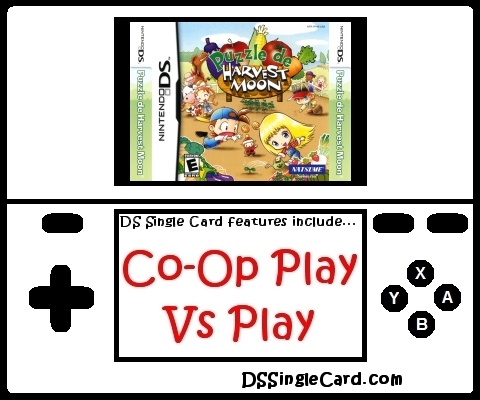 Single-Card download multiplayer fun for 4 players!